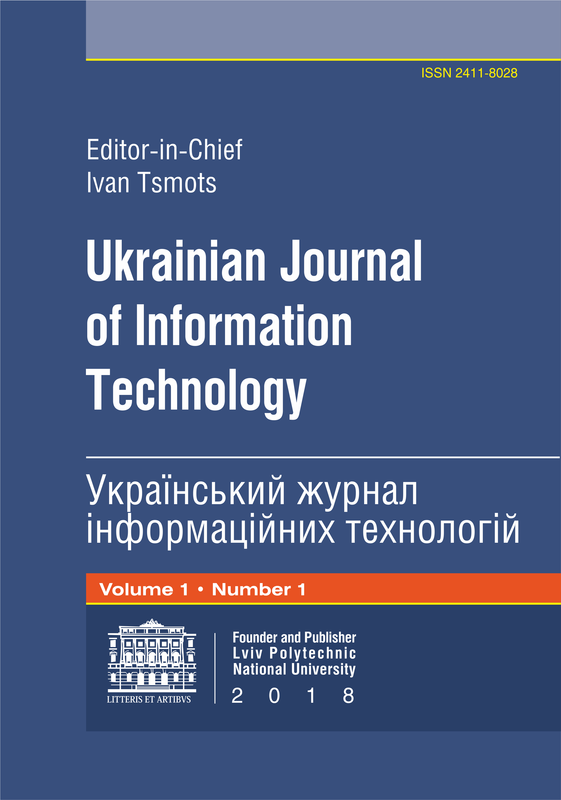 The issue "Ukrainian Journal of Information Technologies" (the Journal) was founded in 2018 by the decision of the Academic Council of the Institute of Computer Science and Information Technologies on April 23, 2018. The Journal is the successor of the Journal of Collected Works "Proceedings of the National University" Lviv Polytechnic", Series: Computer Science and Information Technologies", which is included to the list of professional issues of Ukraine, where materials of theses in the field of Engineering Sciences can be published. The Journal is designed for professionals – programmers, system administrators and analysts, testers of software, scholars of academic and industrial institutions, teachers and university students, who engaged in Computer Science and Information Technologies, as well as in related research areas of Sceince. System Analysis of Information Systems, Technologies and Data. The issue "Ukrainian Journal of Information Technologies" publishes articles in English and Ukrainian written by domestic and foreign scientists, with the subjects of the mentioned above scientific fields, as well as other problems in Computer Science and Information Technologies. The Editorial Board of the Journal does not pay the publication fee to the Authors. The Journal publishes original and fundamental research papers in all fields of Science regarding to advanced studies and reviews of Information Technologies and their commercial and research contributions in Automated information processing and Control; mathematical and software of Information Systems; Models and Methods for estimation of quality and improving the reliability of software and hardware; Software Engineering; Artificial Intelligence; Cryptographic information protection; System Analysis of Information Systems, Technologies and Data and so on. and at the annual scientific sessions of the Scientific Society named after T.Shevchenko in Lviv and other scientific activities that take place in Ukraine with the National University "Lviv Polytechnic" partnership. The purpose of the issue – expansion of scientific publications and discuss ideas for the development of Computer Science, Information Technologies and related areas of Science and involvement to this process the most quantity of representatives of domestic and foreign scientific and professional community. to follow the editorial ethics which contains rules of integrity, confidentiality, oversight publications, account potential conflicts of interest and so on. Certificate of Registration: KV series number 1290 On June 28, 2018. Periodicity – 4 issues per year. Deadline for papers submitting – until the end of the first month (January, April, July, October) each quarter of the year. Free access to the layout of articles. Journal Online at Electronic Archive of scientific research libraries of the National University "Lviv Polytechnic". Online Journal at Edition of Lviv Polytechnic.